This trek provides great views of several soaring Everest region peaks, and a hike up to the base camp of Ama Dablam, so close that you will be gazing almost straight up at this classic Himalayan peak. We will trek through the lush vegetation of Sagarmatha National Park, with pine forests, rhododendron flowers and an abundance of wildlife. You will visit Namche Bazaar in order to acclimatize to higher altitudes, while spending time in the scenic villages of Khunde (3500m) and Khumjung , where you will have the opportunity to interact with the legendary Sherpa people and participate in their astonishing traditional lifestyle.. The following days trekking will bring us to the village of Tengboche (3930m), home to one of the highest Buddhist monasteries in the world (3800 m). From Tengboche you’ll ascend to Pyangboche (4100 m) and then to Ama Dablam Base Camp (4500 m). The close-up view of this iconic peak from base camp is one of the most spectacular images in the Himalayas and a photographer’s dream. Close-up view of Ama Dablam peak, experiencing Sherpa culture in Khumjung village, Tyangboche Monastery. Early morning you will be picked up by your guide to go to the Kathmandu airport, from where we will take the airplane to Lukla, which will take us about 30 minutes of flight time. At Lukla we will be meet our porters and will head north from the airstrip to Chablung (2700m). Here we will cross the Tharo Koshi river on a local-style suspension bridge. Just past the bridge we can see the peak of Kusum Kangru (6367m), which is the most difficult of the so-called “trekking peaks”. Beyond the Tharo Koshi the trail climbs a bit towards Ghat (2590m), we will cross a ridge marked with painted mani stones and climb to Phakding where we will stay overnight (3 hrs). From Phakding we follow the valley of the DudhKoshi river, staying on the west bank of the river. We climb steeply over a rocky ridge towards Benkar (2710m). From here the trail continues alongside the river. All along this part of the trail, villages are interspersed with magnificent forests of rhododendron, magnolia and giant firs. In both the early autumn and late spring, the flowers on this portion of the trek make it a beautiful walk. We cross the Kyashar Khola river and climb out of the valley to Monjo (2840m). Just beyond Monjo the trek enters the Sagarmatha (Everest) National Park, which was established in 1976 to protect a 1148 sq km area surrounding Mt Everest. Beyond the national park entrance station, the trail makes a steep rocky descent and crosses the Dhud Kosi river on a 120m-long suspension bridge towards Jorsale (2830m). After crossing this river a few times while climbing our way up the valley we will reach Namche Bazaar (3420m). Namche Bazaar is the main trading centre in this region and features numerous shops, hotels and restaurants (6 hrs). Acclimatization is important before proceeding higher. Today we will take a day hike through the villages of Khunde and Khumjung. We start with a steep one-hour climb to the Shyangboche airstrip (3790m), from where we will slowly ascend towards Khunde passing numerous chorten (stone Buddhist monuments). From Khunde we follow the trail eastwards to Khumjung, the largest village in Khumbu, at the foot of the sacred peak Khumbila. After enjoying lunch here we will follow a steep switchback trail descending to Chhorkung (3540m). From here it is a quick descent back to Namche Bazaar (5 hrs). Our route of today to Tengboche weaves in and out of side valleys, making small ups and downs, to the teashops of Kenjoma, and joins the trail from Khumjung just before a collection of mani stones. The views of Everest and Ama Dablam are excellent from this part of the trek. We pass the small settlement of Sanasa from where the trail drops towards Phunki Thanga (3250m). From here the trail climbs steeply through forests and around Mani stones as it follows the side of a hill to the saddle on which the monastery of Tengboche sits at 3870m. The view from here is rightly deemed to be one of the world’s most magnificent. Kwangde (6187m), Tawachee (6542m), Everest, Nuptse, Lhotse (8501m), Ama Dablan, Kantega and Thamserku provide an inspiring panorama of Himalayan giants. We will spend the night in Tengboche village (5 hrs). From Tengboche we start our day by descending through forests of birches, conifers and rhododendrons to the village of Devuche. From here the level trail passes many mani walls in a deep rhododendron forest. After crossing the Imja Khola river the route climbs past some magnificently carved mani stones to Pangboche (3860m). This is the highest year-round settlement in the valley, and the Pangboche gompa is the oldest in Khumbu and once contained relics that were said to be the skull and hand of a yeti. (4 hrs). 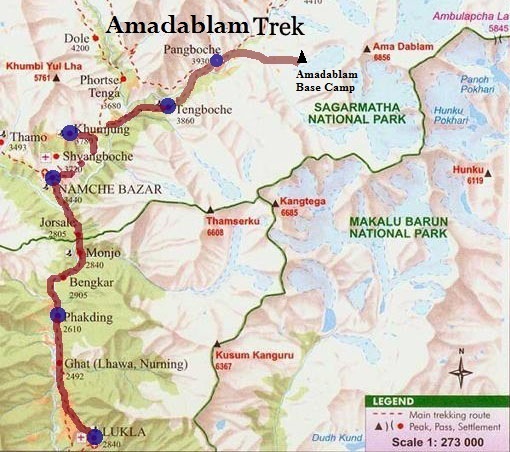 Today you will have the option to trek up to Ama Dablam Base Camp(4700), or the summer settlement of Chhukung at 4730m. From here we have tremendous views of Island Peak (6189m), the south face of Lothse and the south eastern face of Ama Dablam. After enjoying the views here we return back to Dingboche (4 hrs). The route from Dingboche descends the Imja valley, then crosses the Khumbu Khola on a wooden bridge and climbs to rejoin the upward trail at some stone huts. Following the trail downhill from here we will arrive at Tengboche (3 hrs). From Tengboche we retrace our route on Day 6 back to Namche. (6 hrs). It is a long walk from Namche Bazaar to Lukla, but it’s almost all downhill and we should all be in good shape by now. From Namche, we will descend steeply back to the DudhKoshi river and continue our way past the national park checkpoint at Monjo. The trail then continues back towards Lukla, where we will reconfirm our flight tickets for the next day and spend the night (5 hrs). The 35 minutes flight from Lukla will bring us back to Kathmandu. Overnight stay at hotel.